As divorce and family separation increases, it is inevitable that the number of stepfamilies increases too. Family separation is not a one off event, but part of a family dynamic that changes and adapts over time. Parents who find themselves alone for a period of time will very often find someone new that they wish to share their life with. This is normal and can bring a great deal of happiness to everyone involved. Whilst two parents may have ended their own relationship, children will usually still see them as just their mum and dad. The introduction of a new parent can bring up all kinds of issues for children around loyalty. They may feel let down, angry or hurt. If a new partner also has children, then this brings with it a whole set of other concerns. Step, or 'blended', families have to negotiate a whole range of emotional and practical issues. From deciding if, when and where to live together, to dealing with the other biological parents' anxieties, to finding ways of accommodating different sets of values, the road ahead can be rocky. However, with the right kind of information and attention to how you, your children and everyone else involved may be feeling, it is possible to succeed. In a series of six fantastic books written especially for children, award winning author, Ann Bryant, explores the emotions and practicalities that children face when they're living in step-families. The Centre for Separated Families is currently developing its own advice and information. In the meantime, we hope that the following websites will be helpful. 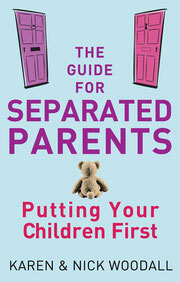 This section of the Parentline Plus website has some valuable information on step parenting. Understanding your feelings and those of others can help you turn a difficult task into a rewarding and enjoyable experience. Stepfamilies Australia has developed a range of practical Tip Sheets on a wide variety of stepfamily issues suitable for stepfamily members, organisations and professionals. A US site founded by family counsellor and author Shirley Cress Dudley to help blended and step families grow to be strong and successful.